The Rock Guy arrives for breakfast with a gift of two feathers -- gull and goose -- a small round stone, and a gnarly beach stick. He calls it a magic stick. It's for knocking down his sculptures. His hair's up early, headed east, west, north. It's been slept on hard in the '75 avocado green Toyota truck he shares with "the Zen master," his dog, Samson. "Some people smoke cigarettes. I stack rocks," says the Ballard-raised Kline. He's kind of homeless at the moment, explains Todd Kline, a boyish looking 38-year-old whose improbably balanced rock sculptures have, for moments or hours or days, graced beaches throughout Seattle this summer. "Some people smoke cigarettes. I stack rocks . . . I don't think, I just be . . . I'm finding my bliss, like Joseph Campbell," says the Ballard-raised wanderer, who calls his truck "Joyota" and speaks in free-flowing fragments of sentences that seem to eddy around partially submerged thoughts. "Stacking rocks is like . . . it's being one with the energy . . . all of nature . . . with the wind, the sun . . . to me the whole thing is passion . . . like the Grateful Dead . . . the passion of the Grateful Dead . . ."
Some come to make it just one more day. Kline's crowd-drawing sculptures could be performance art, if he were a performance artist. They might be big-ticket gallery pieces, if he drilled holes and used wire and epoxy, and had a Masters of Fine Arts from the University of Washington. 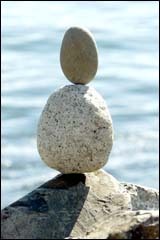 He just balances rocks, in the time-honored tradition of Hawaiian prayer stacks, Himalayan obos, Japanese seki-to. There are beach rocks, river rocks. Little rocks, big rocks. Rocks the size of a human head balanced on a razor edge. Round rocks on triangular rocks. Forty-pound rocks wedged into the tiny crevice of a five-pounder teetering atop an uneven piling. He says he works on a "foundation of nothingness." "I just like the balance . . . everything can be balanced out . . . it's this feeling I get . . . I feel the density, the energy . . . the color, I love the color . . . the tone . . . each rock is like a note of music . . .," he says as he works at a small beach along the Ship Canal. Pilings from an old boat rental still stand along the beach, and locals, inspired by Kline, have created sculptures of their own atop them. None touch the Big If of the Rock Guy, whose precarious pieces seem poised to topple on the first ill-timed breeze. Amazingly, they don't. He credits it to finding the "through line" -- the intangible vertical axis that runs through each sculpture. "It's like a fault line . . . a line that runs straight through . . . everything has a through line . . . a sun ray is a through line from the sun . . .," he says as he hefts a 20-pound rock, turns it on a sharp point, and attempts to balance it on what seems to be a round stone. "It's all friction and gravity . . . gravity works." Both rocks wobble atop the pier as he gently rocks them into place. His movements grow finer and finer. The rushing bits of sentences slow, then stop, and the quivering hands hover like dragonflies around a perfectly balanced rock. For one second, Kline is utterly still. The world is utterly still, holding its breath. It's the point at which a peculiar human urge takes hold in observers: the urge to destroy. "As soon as I turn my back, they knock them down," says the Rock Guy, who passes out "magic sticks" to aid the deconstructionists. "Everyone talks about how it's sculpture, it's art, then they ruin it . . . I could care less . . . I always say, 'Somebody just had a good thought somewhere' . . . like Brian Wilson, 'Good Vibrations' . . ."
Friends describe Kline as creative, upbeat, empathetic. "He definitely is much more concerned about the happiness of others around him than about his own circumstances," says his longtime pal John Ashley, who works for a medical device manufacturer in San Francisco. His father, John Kline, a video production specialist and former Seattle TV newsman now living in Oregon, says his son has always been charismatic. Kline alternates feel-good philosophies with hard-luck stories. The alum of Blanchett High School hit the road after graduation in '80, hitchiking with a friend and carrying a sign that said "We buy the beer." He skipped the college gig, dropped out on the nine-to-five world. "My friends all have real jobs . . . creative people, they can't live normal . . . I try to be in the moment . . . ."
The feats of stability he performs on beaches evade him in everyday life. He can balance rocks. He can't balance a checkbook. He lives on odd jobs, the occasional $20 bill left under a rock and state disability. He describes a chronic arthritic condition as well as learning disabilities such as attention deficit disorder and dyslexia. "I have a bumper sticker that says: 'I don't suffer from insanity. I enjoy every moment of it.'" On inspired days, he can balance five, eight, ten rocks. His tallest sculpture was 17 rocks high. Sometimes he goes for volume. 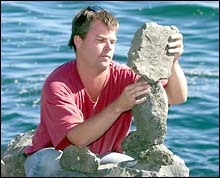 That's the case at Myrtle Edwards Park recently, where Kline ends another day of rock-stacking. He counts almost 50 separate sculptures spread along the breakwater as we watch the sun go down and the tide come in. I finger the feathers in my pocket. Feathers, the Rock Guy says, stand for the freedom to be able to do whatever you want in this wonderful country. Waves lap at the foot of a three-rock stack. It miraculously remains standing until a ferry wake slaps its base. The three rocks tumble into the sea. The tide rises, and, one by one, Kline's sculptures go down. The Rock Guy breaks a long silence. "That's great," he says, "it sums up everything in the universe . . . it's so simple, you know . 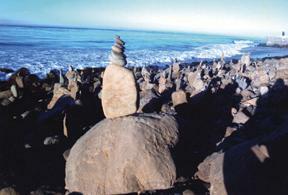 . . "
Todd Kline's rock sculptures have been seen throughout Northwestern Calfornia, including San Francisco. Who needs a real job when you can hang out at the beach all day mesmerizing tourists and locals with your ability to stack large rocks in unimaginable angles? Some people paint. Some sing. Others make movies ... the list goes on as far as the work of artists. Todd Kline balances rocks. It's the one thing he's really good at. It's also his way of expressing his artistic abilities to the world, and, in a sense, it's the way the world shows its appreciation to him in return. Klein, a 43-year-old artist, writer, poet and painter, doesn't have a mailing address. He doesn't own a car, which is good since he quit driving a year and a half ago. He isn't interested in working a nine-to-five job either, although he once worked as a producer for ABC covering the Super Bowl and the Olympics. No, he just wants to be an artist, and if that makes him a little money down the line, then so be it. If not, then that's cool too. "Every artist has a different signature," Kline said. "There are many painters, writers, everything. Mine is just the way I pick the rock. I wouldn't say it's the hardest way because it's the easiest way for me." When he's not spending time in the Great Northwest or San Francisco, Kline's rock sculptures can be found all over Malibu, from Topanga Canyon to County Line, along Mulholland Drive and the shores of Point Dume. His work seems to defy every law of gravity. Large boulders, sometimes weighing 15 or 20 pounds each, are stacked on top of smaller rocks often half the size. This goes on and on for five, seven, nine rocks at a time, straight up in the air. Kline even claims to have constructed a sculpture 17 rocks high several years ago. He says everything is accomplished by recognizing a "through-line," a vertical access point that somehow, he explains, is the key to all things good in the world. "The through-line goes through everything we do, from architecture to a sunray to a wave," Kline said. "Even the fault of an earthquake has a through-line through it. "I can actually see it in people. I can tell people when they're balanced in their life. I see a through-line in them." Kline's work, and perhaps his words, are the types of creations most people can't help but to stop and stare at in amazement. His sculptures are so natural that he never needs to utilize rods, glues or resins to keep his rocks in place. Most amazingly, his sculptures remain perfectly balanced in the face of 15-knot winds, as was the case on a recent Friday afternoon on Leo Carrillo State Beach. "Look what somebody has done with those rocks," a woman walking with a group of young girls said. "Wow!" the children replied in unison. Kline doesn't say anything to the girls or the woman, but there's no doubt he enjoys their enthusiasm. Not that he doesn't like being noticed. In fact, in Malibu, known for its movie-glamorous citizens, Kline has become somewhat of a pseudo celebrity, despite his ragged jogging pants and 24-hour, open-toed shoe policy. "He gets plenty of reaction around here," said Lee Woodford, manager of the Leo Carrillo general store. "You take a rock and balance it at the strangest angle, people are going to come look...It takes a unique mind to do that, a very unique mind. Let's just say Todd is very beloved in our hearts. And he's a little off too, that's part of why we like him." Added fellow campground local Jamie Ault, "His work is rad. It's original. It's unique. He's the original rock star. Nobody does it better." Kline grew up in Ballard, Washington, graduating from Blanchett High School in 1980. His father, John Kline, worked as a TV producer in Seattle before moving to Oregon. Todd said his dad has become more supportive of his career choice later in life, but that wasn't always the case. "Family and friends have not thought balancing rocks was going to get me anywhere," Kline said. "No one really believed in the balancing rocks until I got back to Malibu. Like I said, in Seattle I was known as weird, in San Francisco I was know as a freak, and in Malibu, I'm just an eccentric artist." The Rock Guy, as he is known locally, appears poised to break into the mainstream. He is currently working on a display project for the Malibu Garden Center. Furthermore, he hopes to one day publish a photo memoir of his art and plans on keeping a running documentary of his sculpture-building travels on his Web site, www.stonestill.com, which, like his cell phone, is currently inoperable. "Zen doesn't pay the bills, man," Kline said. "I'm ready to start making some things happen for myself."